NORTH EAST HERE WE COME! This post was written by peterjmurray on May 26th, 2014 3:49 pm Comments Off on NORTH EAST HERE WE COME! Kath and I are now rested after our US trip and to prove the point I ran in the Newbury 10K road race yesterday and did much better than I expected. I finished somewhere in the middle of over 800 runners and managed to finish the 6.23 mile course under the one hour barrier…just under 58 minutes. It was a great experience and quite emotional running alongside so many positive people…all determined to do their bit for charity. We’re busy getting ready for our trip to the North East to visit all of our favourite Middle Schools in Ponteland, Prudhoe, Gosforth, Whitely Bay, Seaton Sluice and Alnwick. It will be an intensive tour…but we can’t wait. So many keen fans and lovely staff waiting to greet us. END OF A FAB WEEK! This post was written by peterjmurray on May 3rd, 2014 2:11 pm Comments Off on END OF A FAB WEEK! Welll…what can we say! Our week in Massachusetts is at an end and we’re now tucked up in a little house in Connecticut with my wife’s cousins, Corrine and Judy. They REALLY look after us! And – WOW! – do we need some well-earned rest and relaxation (R&R) after a SUPERB week visiting four schools close to Concord in Massachusetts. Gardner Middle, Parker Elementary, Northwest Leominster and South East Leominster all proved the perfect hosts to the ‘visitors from little ol’ England’. As our fans and blog readers know, we get a huge welcome from our schools back in the UK, but it seems just a bit more ‘special’ when we get the same amazing welcome in schools so far away on the other side of the Atlantic. 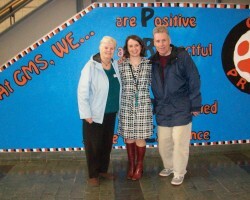 Judy Parker, our close friend from New York, came out and met up with us early in the week and drove us around in style through the beautiful Massachusetts countryside, woods and lakes in abundance, to our waiting schools. Totally different the next school visit to the much smaller school of Parker Elementary. This time we entertained around 60 grade 5 students in a large classroom space. Again, a great audience and we all enjoyed a great session laughing and talking about Mokee Joe. During the book-signing the next day we met up and with chatted to most of the 60 students, all more than keen to get their hands on the Mokee Joe books. Will we ever forget our good friend, Alyssa (see pic), completer with her UK-style hat, but also with her 1-D decoration (Who is One-Direction anyway??). 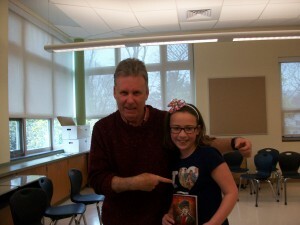 Fortunately, Alyssa was also a great fan of our books, as were many more students at this lovely school. Thank you to all of the students and staff of Parker Elementary for making our stay such a pleasant one. We concluded our Massachusetts Week at two schools very close to each other, Northwest Leominster and Southeast Leominster. The two schools were similar in size and almost identical in providing exceptionally keen audiences of grades 4 and 5 students. Once again, we loved our time with them and the reception from students and staff was nothing short of ‘awesome’! I’m currently wading through the letters of appreciation, artwork and general fabulous feedback from the appreciative students. A fabulous start to our US trip. What more could a UK author want?